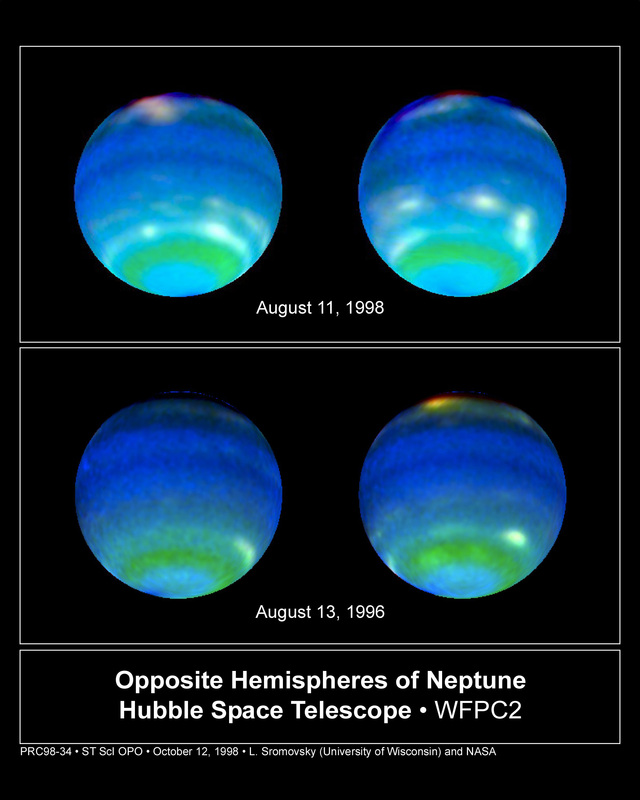 These views of Neptune, as seen through the Hubble Space Telescope, are helping planetary scientists gain some insight into the weird and wild weather that is a hallmark of the eighth planet from the sun. On Neptune, winds blow at 900 miles per hour (approx. 1450 kilometres per hour) and huge storms -- some the size of Earth itself -- come and go with regularity. How, precisely, Neptune's weather is driven is a mystery since the sun, which drives the Earth's weather, is 900 times dimmer there than on Earth. The bottom images show Neptune's Hubble portrait circa 1996. The top images were taken this year and help illustrate the dynamic weather features that dominate the planet.